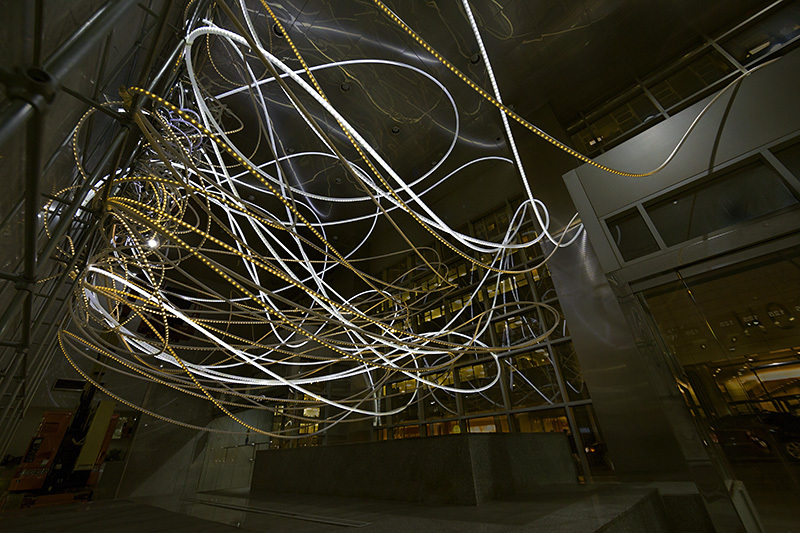 Breathless Maiden Lane explores and reveals the atrium's architecture of 125 Maiden Lane, a glass, marble and granite space in New York's Financial District. This is Amorós' latest sculpture from her newest body of work utilizing LED lights in combination with diffusive material and her signature "bubble" sculptures. Originally from Lima, Peru, Amorós draws from the distinctive Peruvian culture and landscape in her work. The bubbles recall the man-made islands floating on the surface of Lake Titicaca and the long lines of LED tubing allude to distinctive reeds that grow in northern Peru. Amorós suspended Breathless Maiden Lane in the middle of the atrium, hovering above the ground as if weightless. Although the work appears to defy gravity, a structural grid, designed to echo the building's monumental windows, stands against the back wall of the atrium. This structure serves as the work's spine, supporting the bubble sculptures and graceful LED lines. The lines stretch from the bubbles and structure to explore the architecture of the atrium in undulating loops. Some lines touch the window panes as if grasping for the street. 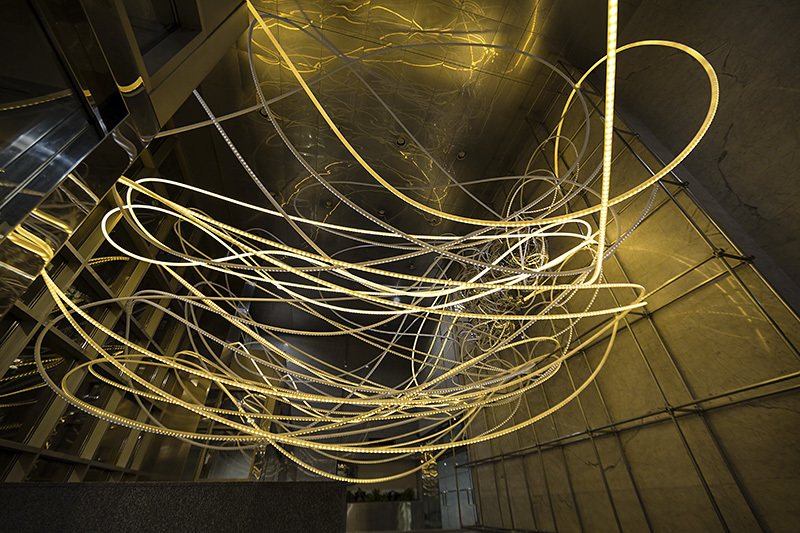 The result is a marvelous tangle of coils, swirls and arcs. 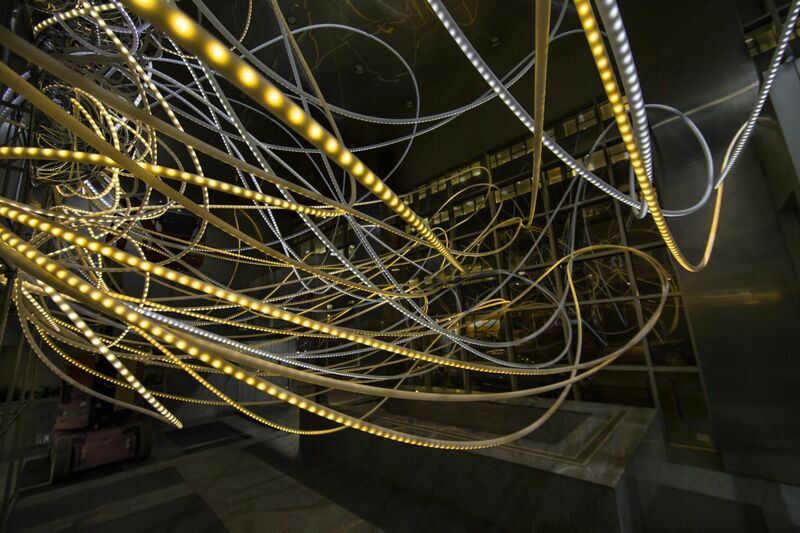 A dynamic pattern activates the LEDs, in four shades of white and a golden yellow, giving the work an ethereal quality. 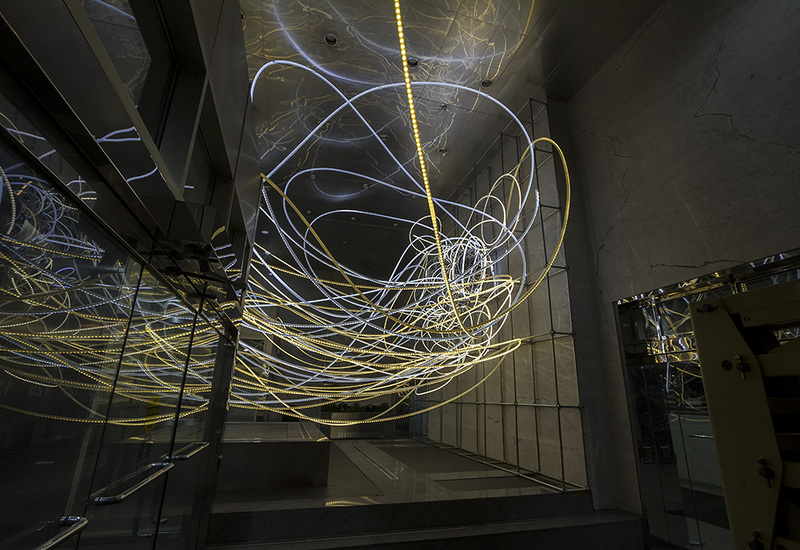 At night, reflections from Breathless Maiden Lane bounce off the high shine marble walls, stainless steel ceiling and windows to create an immersive environment of reflections on an endless feedback loop. Amorós researches the sites, histories and communities of any installation site; however her process remains organic and instinctive. This intuitive relationship to technology is a distinctive feature of Amorós' practice. 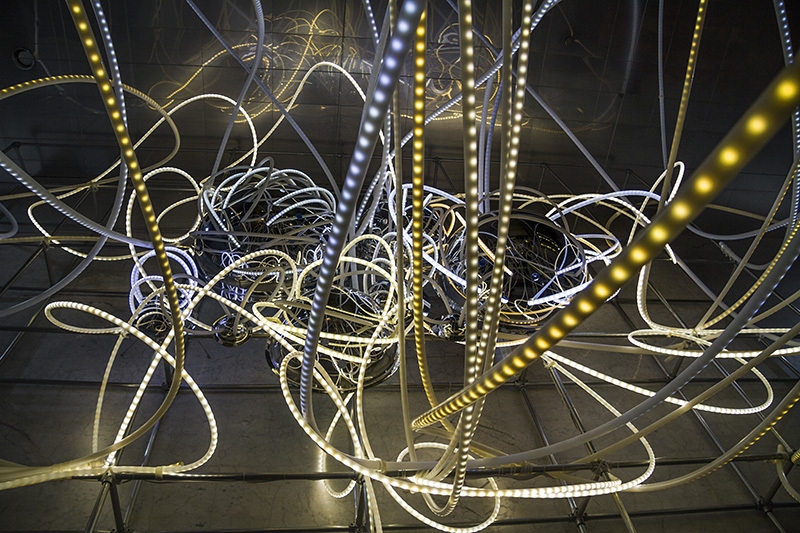 Some elements must be planned and programmed but others, such as the exact placement of the lines of lights, come to Amorós while she installs. 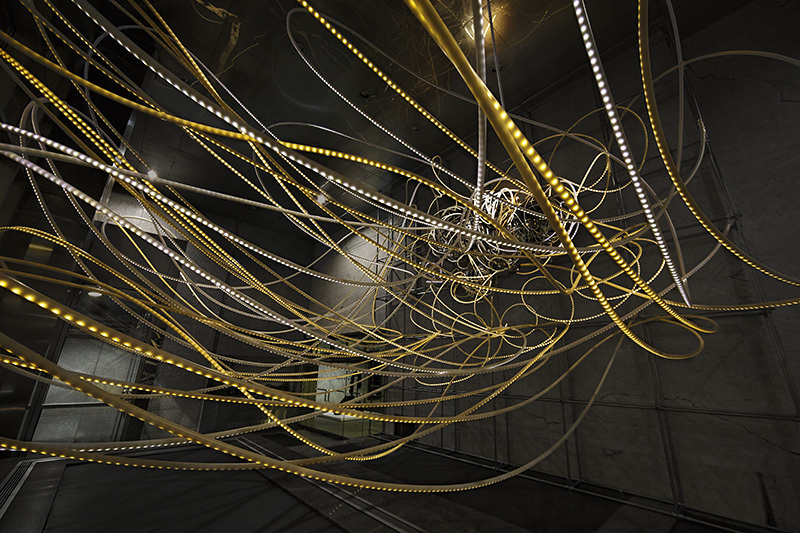 In this sense, the technology does not determine but complements the aesthetics of her work. The glittering lights are undeniably spectacular, but it is the subtle nuances -- the cadence of the custom lighting sequence revealing itself like a musical score -- that compels continued and focused viewing. 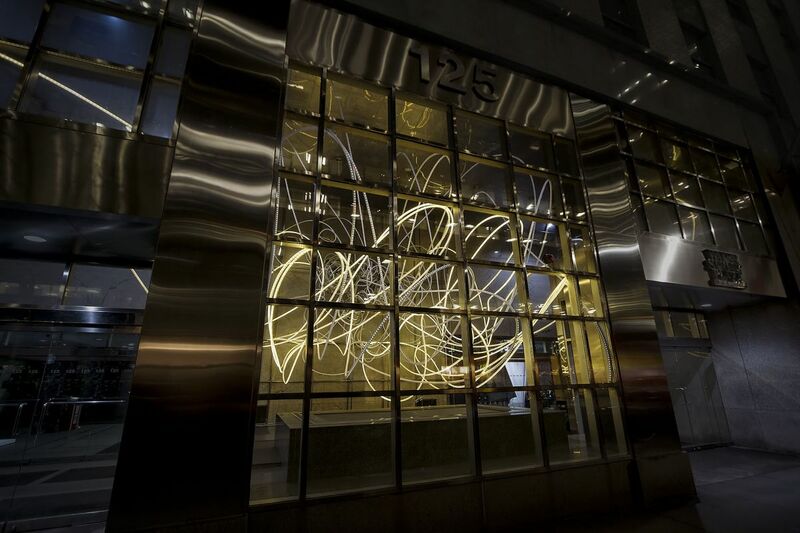 Breathless Maiden Lane is curated by Jennie Lamensdorf and sponsored by the Time Equities Inc. (TEI) Art-in-Buildings. TEI is committed to enriching the experience of our properties through the Art-in-Buildings Program, an innovative approach that brings contemporary art by emerging and mid-career artists to non-traditional exhibition spaces in the interest of promoting artists, expanding the audience for art, and creating a more interesting environment for our building occupants, residents, and their guests. May 12, 2014	View All Press Related to Breathless Maiden Lane.